There may not have been 70 or more TV stations at Espace Leo Ferre but there were more than 70 or more participants, all made welcome by Georges Marsan and representatives of the Mairie of Monaco. Or if you are Beneficiaries of “Maintien a Domicile” (Home Help) from the Mairie. If you plan to go in 2019 to the third edition, don’t expect the Marathon or Greek Wrestling on the program of events. However, one can perhaps expect the same degree of competition and maybe almost as much skill as at the Olympics, but finely tuned with years of experience as these wise aces play Pétanque, Darts and Belote. It’s a good job gambling is not part of the program – because if we played against these veterans we would be guaranteed to lose our shirts. And the whole event was made that much more entertaining by performances of the Star Dolls. Who walked away with the laurels? The medals are actually not for individuals as is the case in the Olympics. To emphasize the spirit of sharing, the participants had been organized into teams. And the teams tended to have their specialities because each game was won by a different team. The Pétanque trophy went to the team from Amicale des Aines monegasques. The Darts trophy was carried off by the team from “Maintien a Domicile”. And those ace card players from Club le Temps de Vivre won at Belote. There is a prize too for the overall winner based on points scored in each discipline. 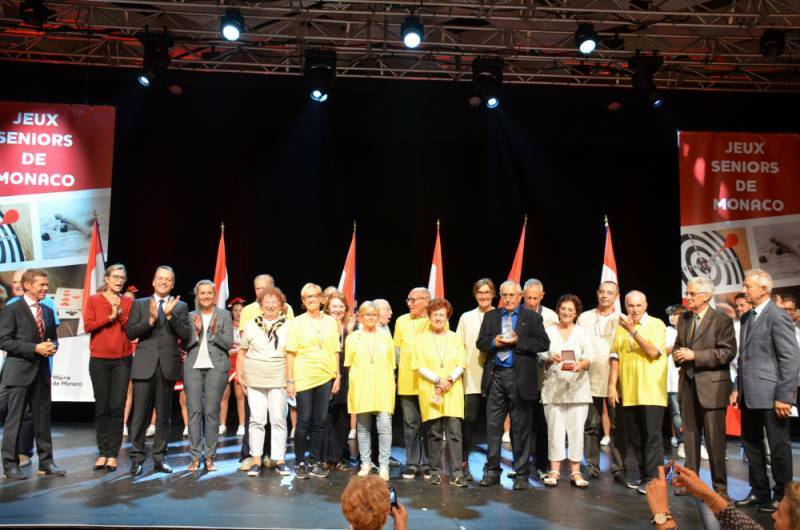 Two years in a row now they’ve won, and will it be a third in 2019 for Amicale des Aines Monegasque? Cheering the winners were the Mayor Georges Marsan and councillors Camille Svara, Jacques Pastor, André J. Campana, Henri Doria, Chloé Boscagli Leclercq, Karyn Ardisson Salopek and Claude Bollati. Also cheering were all the young people who helped organize the Games and who carried the Monaco flag held high. These youngsters rolled up their sleeves and had helped the Seniors throughout the whole Games, picking up darts and running after the boules. Community spirit across generations prevails, especially in Monaco. 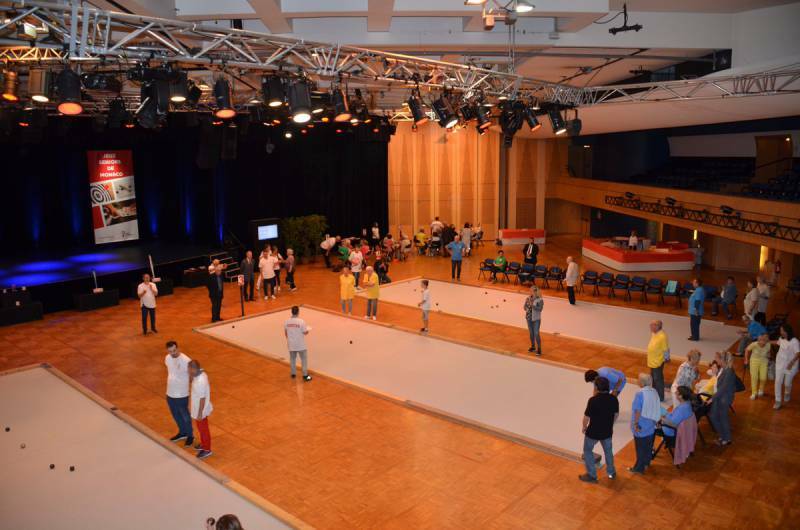 Congratulations to the Social Services of the Mairie of Monaco for organising this second successful Seniors’ Games.